"I've labored long and hard for bread, for honor and for riches, But on my corns too long you've tread, you fine haired sons of _____s." "Here I lay me down to sleep to wait the coming morrow. Perhaps success, perhaps defeat and everlasting sorrow. Yet come what will, I'll try it once, my conditions can't be worse, and if there's money in that box, 'tis money in my purse." Charles Earl Bowles ventured West as a young man in search of Fortune. He began mining the North Fork of the American River, but like so many others he turned to crime and committed almost 30 stagecoach robberies in under five years. All of his work and travel was done on foot, as he feared horses, and he was reported to have massive callouses on his feet. Known as the gentleman bandit, he never once fired a shot and never swore unless it was in his poetry, which he would recite during his robberies. Despite his nonviolent reputation, Wells Fargo quickly grew tired of the lost funds and hired Sheriff James Hume. 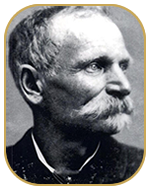 Shortly after, during one of Black Bart's attempted robberies he was shot at in self-defense and was forced to flee. Sheriff Hume searched the area after the attempted robbery and found a cache of rations and goods, which he correctly assumed to be Bart's. Among the rations was a bloody handkerchief with the laundry mark "F.X.0.7." Hume, with assistance, spent the next week visiting nearly every laundry in the nearby Bay Area at the time until one proprietor identified the mark as belonging to a man calling himself C.E. Bolton in a nearby hotel. 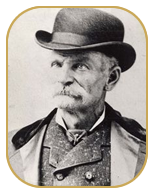 The man was Charles E. Bowles, better known by now as Black Bart, and his arrest was at hand. On November 19th Black Bart, accompanied by James B. Hume, had his last free meal at a nearby upscale restaurant with the very man who captured him before being taken to San Quentin Prison the following morning. He was convicted to six, but serving largely as prison librarian he was able to leave after four years on good behavior. San Quentin was enough for this man, and it is believed he never robbed again.